Daniel 3:23-25 (KJV): And these three men, Shadrach, Meshach, and Abednego, fell down bound into the midst of the burning fiery furnace. Then Nebuchadnezzar the king was astonished, and rose up in haste, and spake, and said unto his counsellors, Did not we cast three men bound into the midst of the fire? They answered and said unto the king, True, O king. He answered and said, Lo, I see four men loose, walking in the midst of the fire, and they have no hurt; and the form of the fourth is like the Son of God. Before Shadrach, Mesach and Abednego were thrown into the fire, the king had commanded that the furnace be heated seven times more! (Daniel 3:19). These fearless men were then cast into the fire. When it was expected that this blazing fire would reduce them to meaningless ashes, a fourth man appeared in the fire! The fourth man, Jesus, is a consuming fire; He is too hot and it took a certain degree of heat in that furnace for Him to appear. Never be afraid of the fires that men build to incinerate you! That is the very place Jesus will appear. It does not matter how hot it burns. That fire, that circumstance that looks like it will consume you alive is the very opportunity God is waiting for to show up on your behalf. 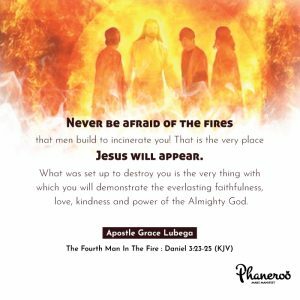 In that fire, men will look at you and know that you are not alone for God is with you! In that fiery storm, your enemies will examine your life and declare that Jehovah God is truly on your side! What was set up to destroy you is the very thing with which you will demonstrate the everlasting faithfulness, love, kindness and power of the Almighty God. Hallelujah! Never be afraid of the fires that men build to incinerate you! That is the very place Jesus will appear. What was set up to destroy you is the very thing with which you will demonstrate the everlasting faithfulness, love, kindness and power of the Almighty God. PRAYER: Father, I thank you for today’s Word. What a comfort to know that no matter how hot the flames, you are always with me. These are the convictions of Emmanuel–the knowledge that God is with me. How can I be afraid of circumstances when you can never let any fire consume me or any waters drown me? I don’t care how hot the furnace might be, I have God. I can never be defeated, I can never be consumed. Victory is my story. In Jesus’ name. Amen.